A journey just as difficult as my coming out process. Happy Pride month! This June, I've decided to only write on queer topics to both celebrate my own lesbian identity and to add to the (small) pool of existing queer content. Last week, I wrote a feature on one of my favorite queer musicians. Next up: a personal essay on my own journey with discovering my queer style. It took me six years after my initial fascination with women to finally come to terms with the fact that I not only would never be in a relationship with a man, but also that my identity is inherently tied to this fact and that queerness will always be a crucial aspect of my life. Whew. Glad I got that out of the way. Obviously, it took a lot more than a simple realization to make it to where I am today. Who knew that the coming out process wasn't a linear and singular narrative?! Nonetheless, I made it. Meaning that I finally feel comfortable in my own skin, finally feel comfortable about writing to the world about a part of my life that I feel so strongly about. While sexuality has always been this minuscule detail in my life that I never paid much attention to until a few years ago, style has been there since day one. When I was ten, I cared more about my outfit than I did having friends; at 13, I thought I was the coolest kid in middle school because I solely shopped at Urban Outfitters; three years later, I understood that style was a huge part of my identity and I started this blog to celebrate that realization. For four years! It's insane to think that I've been so into my personal style that I've been constantly writing about it for that long, especially when it's taken so many turns that it's hardly possible to track every phase I've gone through. One could argue that my journey with discovering my real style has held far more challenges than actually understanding my sexuality. A bit exaggerated? Maybe. But when I finally realized that my style and queerness are so heavily connected, maybe saying that the two have been difficult journeys is accurate, as so much overlapping has occurred. Let's look into my dark, dark past, shall we? Today's high of 80 degrees allowed me to dress freely for spring. Read more in my most recent blog post to see how I created this simple yet well put together outfit. This is when I was 16 and thought pants were the devil. I also thought that I would have long hair for the rest of my life and wear a full face of makeup until death. My cringe-y, junior-year self, aka my peak of femininity. 17-year-old me did a little better: she discovered bleach for the hair and sneakers for the feet! Also, the dress carries some qualities I'd wear today—we love a good button-down dress. Femininity still there, but it feels a bit cooler. She discovered her first article of clothing that would hold a lot of queer power, but she didn't know it just yet. She also discovered short hair! This is two weeks into my freshman year of college, thinking I was super cool because I was wearing a dad shirt and had a bob, but I still felt v femme by wearing a denim skirt that I no longer own because I can hardly move in it. However, this shirt is what made me give up bras for the most part, and today, I wear it whenever I want to feel like my gayest self. Very queer, right? BUT! I didn't know how to incorporate this wonderful, wonderful identity into my style just yet. I was struggling with the fact that I was gay but was head-over-heels in love with fashion and knew how heteronormative the industry is and that liking clothes isn't a typical thing that lesbians partake in. Toxic ideas, yes, but they were also very relevant ideas that I could not get out of my mind. I knew I didn't necessarily feel like a typical femme lesbian—all of the representations I was exposed to were very invested in lipstick and wearing skirts, and I learned to hate the two but was still attached to a personal style that was not high femme but nowhere near butch. 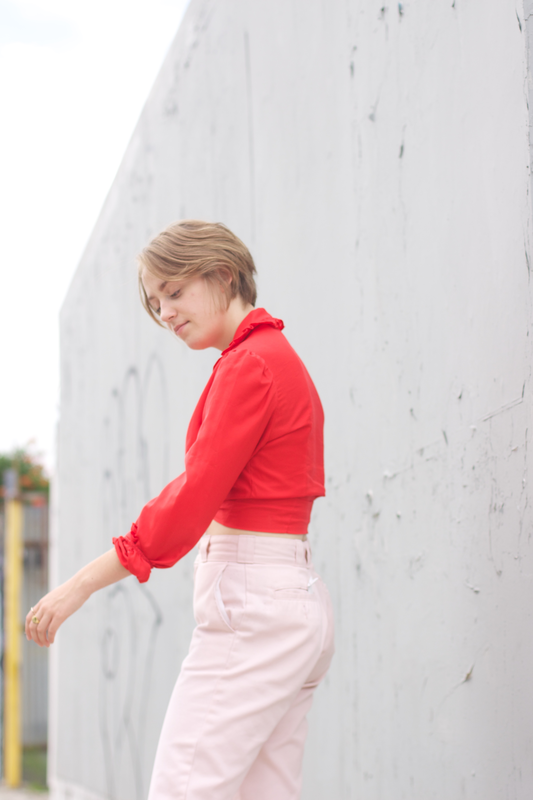 I knew I loved pants, especially of the baggy type, but also liked tight tops and fun feminine shoes that seemed to define my style even though I had no idea how to put that concept into words. And that resulted in the above 'fit: a look that did not resemble my queer style at the time but, after some analysis one year later, might just be the mirror image of what I internalized with my newfound queer sexuality. After (sadly) leaving NYC for school came a long year of some heavy soul-searching. You could say that my year as an 18-year-old was when I spent hours, days, even weeks trying to figure out what I identified as, and that my year as a 19-year-old was when I rethought everything I once knew about style. I ditched trends and prototypes that I assumed queer women to look like, played with the idea of masculinity and femininity a lot, I realized that I hated the concept of dresses unless I felt like my most authentic, queer self in them (like this one). I fell in love with pants and graphic tees and realized that I equally liked sneakers and heels, depending on my mood. I kept cutting my hair shorter and shorter but still felt an attachment to feminine pieces, but would only be able to wear them paired with masculine pieces—think open-toed mules with Levi's or a midi dress with Vans. I've always known since day one that my personal style was constantly shifting, but now that I connect this phenomenon to queerness, I feel like I've unlocked a mystery I've been trying to figure out my entire life. Identity and style are connected, but what happens when the two are constantly shifting? Does one impact the other, do they move together, does one change while the other stays the same? The answer that might be frustrating to some is all of the above. The beauty in style is that it can perfectly match your internal identity, can partially match it, or just be a completely different vessel that showcases a whole other aspect of your life. You don't need to present yourself in a way that society expects you to—the whole point of queerness is to be authentic to yourself, and this is evident in what we choose to put on our bodies. So I finally figured it out. Some days I like masculine looks, other days I like feminine ones. Most days I like a mix of the two. I feel really good in my short hair, I feel on top of the world when I wear what feels comfortable and true to my identity. That's what personal style is all about, no? Top, jeans, and sunglasses by Madewell (yep, still working there). Shoes are vintage. I could get into the science of this whole look: I finally feel like my true, lesbian self with my new hair, double-denim is a look that makes me feel gayer than ever, and I have a perfect mix of masc and fem features to make myself look like the queen of androgyny. But technicalities aside, this outfit feels like the epitome of my queer self, at least for now, just because, to put it simply, I feel like myself. It feels good. Not much more to say on that one. I wish I could write a dissertation on this singular outfit, but style has always been a visual vehicle for the ideas that I can't seem to put into words. The outfit says it all! TLDR: if you're queer and have not taken a second to think about your style, stop and think. Truly think. Are you presenting in a way that you want to present, even if it doesn't match up with society's expectations? Or are you letting other queer representations do the work for you instead of carrying a style that you wish to carry? I've said it once and I'll say it again: to be queer is to be your most authentic self, so your style should also be only what you want it to be. It's that simple, even in a world where sexuality and gender get more complicated each day. To my fellow queer readers: do you feel that your style and queerness are inherently connected? Let me know in the comments—I'd love to chat!